Directly from the world-famous Peppini collection this is the Combat knife that Bob Loveless made in very few pieces for Abercrombie & Fitch in 1956 with ultra rare DELAWARE MAID logo on the blade; brass guard, aluminum pommel, leather handle, bakelite spacers. The original leather sheath is included. A true ONE OF A KIND, it's the original knife photographed on the books "RW Loveless" on page 25. Certificate of authenticity is included. Don't hesitate to contact me for more information.. 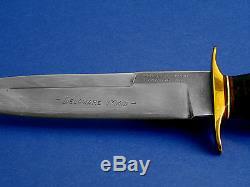 The item "LOVELESS COMBAT KNIFE DELAWARE 1956 ONE OF KIND" is in sale since Friday, June 9, 2017. This item is in the category "Collectibles\Knives, Swords & Blades\Collectible Folding Knives\Modern Folding Knives\Custom & Handmade". 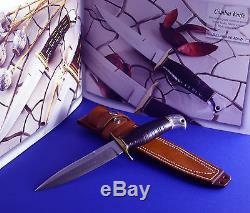 The seller is "blade1871" and is located in Roma. This item can be shipped worldwide.